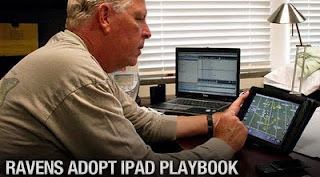 The Baltimore Ravens (my favorite football team) now distribute iPads to it's players, rather than the old-fashioned playbooks & to me, that seems like an excellent idea. Players now have the convenience reviewing game film, studying plays & game plans all in one device. The only other team that seems to use iPads for playbooks are the Tampa Bay Buccaneers, so it appears the Ravens are on the cutting edge in this regard. According to the blog I read on the teams website, Ravens offensive coordinator, Cam Cameron (pictured above) wondered if the team's several-hundred page playbook could somehow be transferred to some sort of tablet device. Less than a year later - the notion is a reality. The teams says the responses by players & coaches alike, have been rather positive so far -- well duhhh! Lol. "There are things it’s good for & things that the paper is better for. You can put video on it, which is very convenient. It’s nice to not have to carry around a giant playbook all week. “I do print some things out so I can mark down the route progressions & things like that, but in all, it’s been an easy transition", said Ravens quarterback Joe Flacco. The team purchased 110 iPads & even purchased 10 more when the NFL expanded training camp rosters to 90 players this year. According to Nick Fusee, the Ravens' Director of Information Technology, several tablets were tested before settling on Apple's 64 gb iPad 2. Fusee expects the new playbook distribution method to save the considerable printing costs over the new few years. “Our video staff has already got the game loaded on their laptop, so all they have to do is plug in through iTunes & load it up on the plane. It only takes a minute, & the guys like that,” Fusee added. Another huge benefit of going the iPad route is that the Ravens cam always remotely wipe data from any stolen or missing iPad ensuring that playbook & scouting info doesn't 'conveniently' fall into the hand of another team. Additional security measures include automatic wiping of the device after 3 incorrect password entries. Yea, I know - it was more than 3 weeks ago, but I'm still angry about it... ever since Roger Goodell took over as NFL Commissioner in 2006, I've generally been supportive of the changes he's made & pretty much given him a pass on most of the questionable rule-changes & decisions he's made, but the Terrelle Pryor 5-game suspension, quite honestly, pissed me off. Just to catch you up, Pryor (and 4 other teammates) received a 5-game by the NCAA for selling championship rings jerseys and awards along with accepting gifts & money from a tattoo parlor & it's owner during his time at Ohio State University, an infraction his coach Jim Tressel, had full knowledge of, but failed to report to the NCAA. The improper benefits were later discovered by the NCAA this past winter, but Pryor & company were allowed to play in OSU's bowl game, provided they agree to serve the 5-game suspension the following season. Pryor & his 4 co-conspirators did indeed participate in the Sugar Bowl (a 31-26 victory over Arkansas), but this summer Tressel resigned as head coach of OSU amid the ongoing scandal & Pryor decided to go pro, rather than return to OSU. Since the NFL draft had already taken place in April, Pryor entered his name into the NFL's supplemental draft (a closed-door draft held for players with special circumstances preventing them from participating in the NFL's general draft) to be held just before the start of the season. He was allowed to participate in the draft provided he agree to serve a 5-game NFL suspension following his eventual selection by the Oakland Raiders in the supplemental draft. There are few things in life that bug me more than interfering with a person's right to go out & make money. 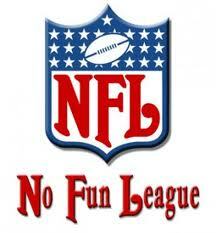 In my mind, the league has no right (nor authority) to impose any sort of suspension based upon infractions in a previous 'amateur' league. Yes, he most likely committed infractions while a student-athlete but there is no previous precedent that justifies commuting an NCAA suspension to any sort of NFL punishment. In fact, the exact opposite is the only precedent that existed before this situation. In 2009, Jeremy Jarmon was suspended for his ENTIRE senior season at the University of Kentucky for what the NCAA called an illegal diuretic. The NFL allowed him into the supplemental draft that year with no carryover punishment whatsoever, so.... wtf??? Colleges & universities are hit with NCAA sanctions all the time based upon infractions committed by players who have long since gone pro, so why is Pryor being made an example here? It would have been all-too-easy for the League to develop & properly publicize such future penalties for players who go pro & are later found (or already known) to be violators of NCAA rules, but to be singled-out & be used as a lab rat isn't right either. This is the same league that denied Johnny Unitas (& many more) disability pay for injuries clearly sustained as a result of a professional football career, & now all of the sudden the league has a conscience? Yea, right. League spokesperson Greg Aiello said Pryor was suspended by Goodell for 'essentially' violating the spirit of the supplemental draft... really? So violating the spirit of rule justifies completely making up your own in response? The case-by-case evaluation of players to be disciplined by the league has gotten completely out of hand. It seems that Gooddell & the League office haven't a clue as what they're doing & I'm wondering when the NFL Player's Association (or any civil rights group for that matter) will step-in. I was even MORE disappointed to learn that Pryor would not be appealing the 5-game suspension. I guess I understand why - he just wants to cut his losses & get started with his pro career & put this all behind him, who could blame him? 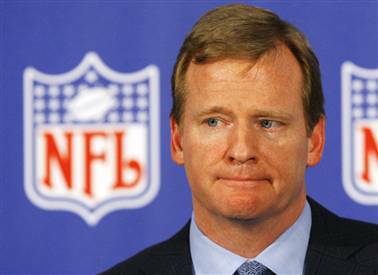 But I think he did he & his fellow league players a bit of a disservice by giving-in to 'Master Goodell' so easily. Incidentally, did you know that a violation of the league's substance abuse policy typically only carries a suspension of about 4 games (for repeat offenders) & as few as 1 game, or in the case of popular stars like Pittsburgh's Hines Ward, a 0-game suspension? So that means the NFL's penalty for getting slapped with DUI, using coke, smoking weed or taking steroids is LESS severe than receiving improper benefits while attending any of the NCAA's member schools - what a f@#%ed up system. Oh & Pryor's former college coach? He accepted a coaching position with the Indianapolis Colts, without penalty from the League. Instead, the Colts themselves decided to suspend Tressel (for 5-games) days later, as the new hiring began to pick up steam among media outlets. When asked about the team-imposed suspension, Goodell said he would have suspended Tressel if the Colts had not already done so, bull-sh!t, absolute bull-sh!t. He didn't waste a moment suspending Pryor beforehand, so why would he sit back and allow the Colts the opportunity discipline Tressel themselves, when he hadn't offered the Raiders the same opportunity with Pryor??? While I don't condone Pryor's improper actions, such infractions have existed for years & it's hardly fair to use Pryor as an example to help supplement the League's weak stance regarding players & their previous NCAA infractions before turning pro. What if you quit a VOLUNTEER job, failed to give 2-weeks notice & the government decided to dock your 1st 2-weeks of pay at your new PAYING gig? The way I see it, that's basically what happened here. Yes, quitting the job & giving no notice is certainly frowned upon & probably considered immoral by many, but you'd go ballistic if you were penalized for actions taken while employed in a previous position.